We all know that a photo diode can be used as a light detector and as a light emitter (although the way that it's built will usually make it specialized to prioritize one application over the other); an electric motor can become an electric generator and vice-versa. How does one run a resistor in reverse bias (ie: turn heat into electricity, rather than electricity into heat)? Something in my gut (but I had a hard time googling it) tells me that if I hold a resistor over a candle flame: it won't instantly become a little battery. So do I add an oscillating inductive coil around it; should I hold it over a candle but add a diode? I'm at a loss on this one. Please note: I have like zero budget and no safe laboratory space for tinkering, so out of a general respect for my home: I have to avoid the funner flammable projects, so this is why I need to ask dumb questions, because I'm prevented from experimenting; otherwise I wouldn't have bothered you all. I partially feel bad for asking [because it feels so elementary], but if I don't: I'll remain ignorant. The short answer is you can't because physics. The long answer is you can't because voltage is a difference of potential. What you're looking for does exist. Thermoelectric generators translate a difference in heat into a difference of potential through the reactions between different materials. A resistor is generally a fairly uniform material exposed to a fairly uniform ambient temperature. There isn't anything inherent to its construction that would allow for a difference of potential by apply a single temperature. The heat that is produced is a waste product. The process can't simply be reversed. The dual action in some components is possible due to specific electromagnetic phenomena inherent to their physical construction, so we can't arbitrarily assume all components can be used to generate a voltage. And it's a good thing too. If that were the case we would have to be worried about voltage spikes as soon as the power is removed as the heat is absorbed like a magnetic field collapsing around an inductor. And because all components generate heat, there would be no way to control for it. Creating a stable circuit would be impossible. In general adding heat to a resistor will change it's resistive property. A negative temperature coefficient resistor will have it's resistance go down with increased temperature. On the other hand a positive temperature coefficient resistor will see an increase of resistance as temperature rises. The change of resistance does not alter the fact that the resistor is still a dissipative device that essentially raises the net entropy of the universe. Where \$k_B\$ is Boltzmann's constant, T is the temperature in kelvin, R is the resistance in ohms and \$\Delta F\$ is the bandwidth of the noise you might be interested in. See this wiki article for more information and see this calculator you can use to determine the values of RMS voltages produced. For instance, with R = 10 giga ohm and at 500 degC (773 kelvin), over a 1 MHz bandwidth you could measure about 15 mV. “Energy conversions” would be the correct term for your question. e.g. Reciprocal energy Conversions include (thermo-peltier)(electro-chemical) (vibration/piezo-electric)!but resistors are not. 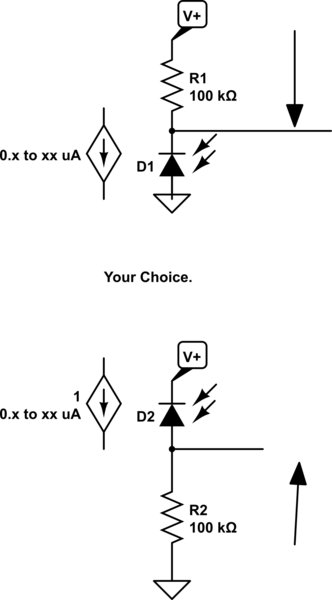 Photo Diode is reverse biased in both cases. The high Resistor value is just a current sensor that converts photons into current then into voltage. Not the answer you're looking for? Browse other questions tagged resistors heat bias detector reverse or ask your own question. What is the purpose of a bias resistor? How to add a DC bias? Can I reverse bias the base-emitter of a BJT transistor?